The Willett Family has purchased Sebewaing Concrete Products Inc. This includes ready mix plants in Sebewaing and Cass City (Tuckey), a portable plant in Deckerville, and a gravel pit located just West of Cass City on M-81. The pit is open to the public for all your sand and stone needs. The Sebewaing plant even produces concrete block! 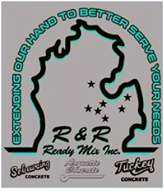 We are excited to grow our business into the Thumb under the company name R & R Concrete & Supply, LLC. Let us know how we can help your next project come along throughout the Great Lakes Bay Region and beyond!